Organic Solutions! Inc. Featured in National Lawn Care Magazine! For more reviews visit our "REVIEWS" tab! Organic Solutions! Inc. is a Nampa landscaping and lawn care company that serves Meridian Idaho, Boise Idaho, Eagle Idaho, and Nampa Idaho and provides a variety of services from Organic lawn fertilizer, commercial property maintenance, lawn mowing, and landscape lighting to outdoor kitchens. We work with you to ensure you love your new yard. Your landscape only gets one chance to make a good first impression. If your lawn, yard, and landscaping could use some work, a qualified landscaper from Organic Solutions! Inc can help. As a premier landscaping service in Meridian, Boise, Eagle, and Nampa our goal is to transform your property's exterior and provide the lawn care and landscape maintenance necessary to keep it looking its best. We Specialize in Landscaping, Landscape Maintenance, Organic Lawn Fertilizers, Sprinkler Systems, Lawn Care, Lawn Mowing, Tree pruning, Tree service, Firewood, Residential Snow Removal and much more. Maintaining a yard and lawn takes dedication and skill, and the larger your Meridian, Boise, Eagle, or Nampa property, the more attention it will need. Many working people don't have the time or equipment necessary for proper maintenance, and that's where we come in. We offer a variety of landscaping maintenance packages to suit your needs. From basic lawn mowing to organic lawn fertilization and cleanup, we'll keep your property looking nice and groomed. Hiring a landscaper means making an ongoing investment in your property. You deserve to enjoy your outdoor space to the fullest, and in Meridian, curb appeal can go a long way when you're looking to sell. Landscaping services from Organic Solutions! Inc can increase the value of your property, all the while enabling you to take pride in its exterior. Organic Solutions will assist you at every stage, from preconstruction to completion. Learn more about the services we provide.﻿ We're proud of our achievements. Visit our projects page to explore our portfolio and see a sampling of our completed work. When it comes to aesthetics and design, well-defined lines create a finished look and when it comes to your landscape, edging is an important part of creating a beautifully manicured appearance. Besides enhancing the appearance of your outdoor space, edging will help prevent grass from invading your flowerbeds. Here are some tips for creating a crisp looking edge in your yard: Outline your edge – This step is only necessary if you are creating a new bed. With a garden hose or rope, mark your desired lines. Remember that curved lines are more natural and are easier to maintain than straight lines. Cut your edge – Using a spade, half-moon edger or other tool designed for edging, refresh your existing edge. For new edges, Cut straight down between the lawn and garden bed about 6”. Then make another cut at a 45 degree angle toward the garden bed and away from the lawn until the two cuts meet. Remove Turf – You can easily remove the loosened turf by hand. If you have a compost pile, flip the turf chunks upside down and they will naturally die and become excellent mulch – if you place the grass right side up in the pile it could root and grow rather than decompose. Create a trench – as you remove the turf, shaking off excess soil, you can mound the soil uphill towards the garden bed. This trench is important for water to drain and soil to fall into as well creating a nice clean look. Hone the Edge – for extra clean lines, use hand shears and cut any remaining grass blades along the vertical edge. You can also do this step a couple of times during the season to keep your edges looking neat and manicured or use your trimmer each time you mow. 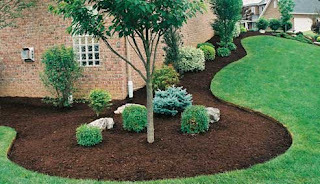 Mulch the Bed – The final step is to add mulch to your edge as well as the garden beds. Garden beds needs about 2 to 3 inches of mulch which will help keep in moisture and suppress weeds. Besides the traditional trench edge, you can also use decorative edging such as bricks, stones, and fencing material or more permanent edging such as metal rails, concrete curbing or mortared bricks and stones. Finding materials that complement your existing home and landscape will enhance the overall effect and beauty of your outdoor spaces. At Organic Solutions! Inc., we can help you create a professional looking edge to your landscape as well as give you a healthy, dense, and green grass. If you would like an estimate on any of our lawn care or landscaping services, give us a call, 208-884-8986, or email us, organicsolutionsinc@outlook.com Website: www.idahoorganicsolutions.com Don't forget to find and follow us on Facebook! More and more people are realizing the importance of being environmentally responsible and asking how they can have a beautiful landscape as well as nurture wildlife and reduce one’s impact on the environment. 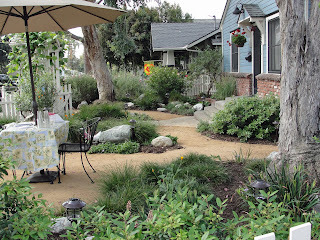 If you would like your outdoor space to a be a safe, healthy, eco-friendly place for friends and family to gather to relax, eat, and play together then you might consider now some of these “green” options. 1. Native plants Using plants that are native to your area also means they are more suited to growing in your local environment, which makes them more resistance to pests and diseases. It also means they will require less maintenance and water than other more exotic plants. 2. Butterflies and Bees Provide areas in your yard and garden to attract nature’s pollinators; the butterflies and bees. In North America we are in the midst of a major bee epidemic and bees are a much needed source of pollination for crop production so any steps we can take to increase the bee population is good step ecologically speaking. It has been suggested that having 10 or more species of attractive plants is the best way to entice most bees. 3. Trees Planting trees is a great benefit to the environment, not only can trees reduce pollution by cleaning the air we breathe, they can also reduce energy use. Planting a deciduous tree which drops its leaves in the fall is a great way to provide shade in the summer and allow sunlight to flow through in the winter. Planting trees on the east and west facing sides of your home will maximize their benefit. You can also plant evergreen trees to block the cold winter winds. Once you have determined the most dominant direction of wind during the winter months you can then plant your evergreens upwind to achieve the best protection. 4. Automatic Irrigation system Having a built in sprinkler system can actually reduce water usage especially if your landscaping has different water requirements in different zones. Plants and trees benefit from deep root soaking periodically rather than light shallow watering. And watering the yard in the early morning will reduce water loss to evaporation as well aid in absorption. Drip irrigation systems are even more efficient and allows you to deliver the water directly to where it is needed. 5. Water permeable patio A growing trend in landscape materials for patios is using materials that are water permeable. There are many options available from flagstone to new permeable pavers made of concrete and other materials that allow water to flow through to the aquifers rather than pool and evaporate. 6. Recycled materials Using building materials that are recycled is also another way to benefit the environment. There are many products available that use recycled materials like rubbers and plastics and keep them out of our landfills. They have recycled patio pavers as well as materials that will create a beautiful deck that looks like wood. They even have recycled concrete that is used like gravel. 7. Organic fertilizer Organic fertilizers help the environment in many ways. One of the biggest reasons to use an organic material on your lawn and plants is to reduce harmful wastewater run off. Another very good reason to use organic products is because they are safer for you, your family, and your pets. You can make a difference to the environment from your own backyard! If you are interested in sustainable landscape designs that reduce waste and promote a healthy environment, contact Organic Solutions! Inc., a family owned business that cares about you, your family and the environment in which you work, live, and play. Phone: 208-884-898 Email: organicsolutionsinc@outlook.com Website: www.idahoorganicsolutions.com Don't forget to find and follow us on Facebook!